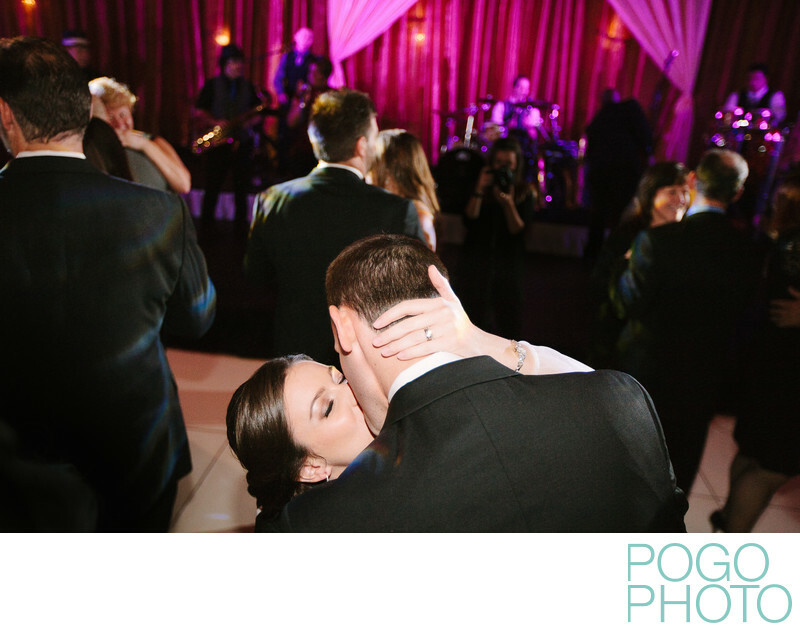 A stolen kiss on the dance floor can be a private moment, but odds are good that we'll capture it anyway! One of our favorite things about weddings is becoming part of the flow of the party, spinning and dancing right along with our clients and their guests until they've forgotten that we are still capturing moments as they happen. Sometimes we’re noticed anyway, and sometimes it’s hard to avoid us (we are strapped to the gills with photography gear, after all), but generally we consider it a fine compliment to be told that we weren’t noticed at all. When our clients gasp at images of moments when they thought they were alone and unobserved we are not-so-secretly thrilled! This kiss was impromptu and hopelessly romantic; the groom swept his new bride off her feet all night, but this moment in particular made us pause and smile when reviewing the images later. The whirling couples nearby are oblivious to this sweet vignette, the band's energy has ebbed to a classic love song, and the warm red/magenta of the uplighting plays off the creaminess of the bride's skin, highlighting her newly paired wedding and engagement rings. The B'nai Torah in Boca Raton is an excellent venue for a traditional or modern Jewish ceremony, providing plenty of space for both the ceremony and the reception, with lovely spaces outdoors for romantic portraits of the happy couple. This wedding in particular took full advantage of the large spaces available, creating a beautiful event for their many guests and family members. Location: 6261 SW 18th St, Boca Raton, FL 33433. 1/200; f/2.8; ISO 800; 31.0 mm.